The Messiah Bowl by Vapor Hookahs is a fantastically modern funnel-shaped hookah bowl. The funnel shape allows for the hookah tobacco juices to remain inside the hookah bowl instead of dripping down the inside of the hookah stem. The Messiah features a unique lip for heat management devices (HMDs) to rest on, making this hookah bowl perfectly suited for the modern hookah enthusiast. This allows for longer and more flavorful hookah sessions. 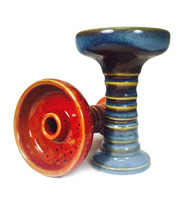 Funnel-shaped hookah bowls are the most popular hookah bowl style on the market today thanks to their convenience and how well they enhance every hookah session. The high-gloss Messiah Bowl takes the cake when it comes to high-quality funnel bowls. This hookah bowl is available in four riveting color options and showcases a unique, subtle dapple pattern that gives this bowl a gorgeous sense of depth. The Messiah is very sturdy and sleek, giving off a custom hookah bowl look while maintaining affordability and functionality. The Messiah Bowl can hold approximately 35 grams of Flavored Hookah Tobacco.